← Happy Easter from the Archives! After being accepted to several archival and library schools across Canada, Kaitlin chose the program farthest from this coast, Halifax. 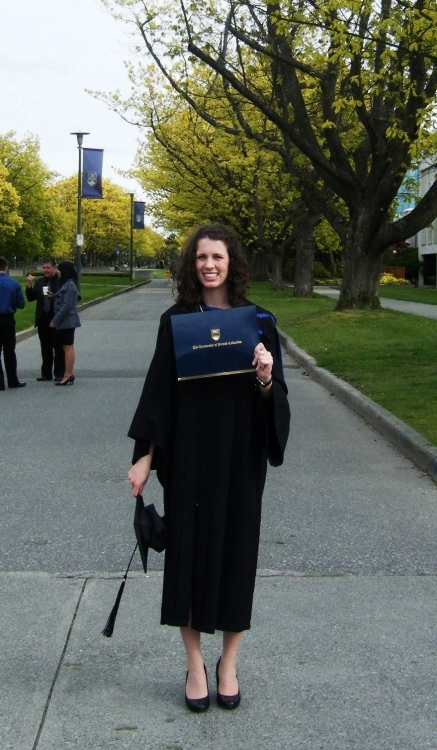 She will be earning a Master of Library and Information Studies at Dalhousie starting in 2014. Her choice to defer for a year will allow her to continue working for the UN as a flight attendant. Between stints in Africa, which she is currently visiting, we hope Kaitlin will find some down time to visit us before she goes jetting off again! 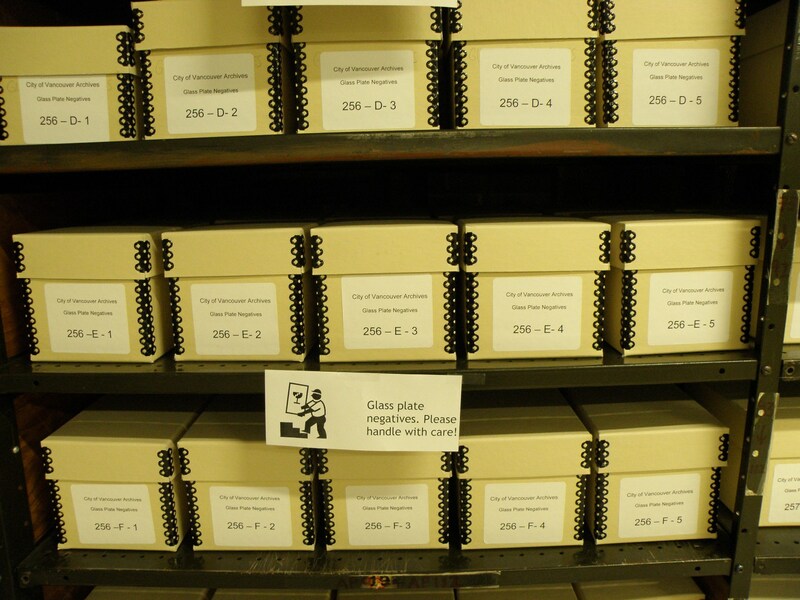 Our former glass plate negative storage cabinets. Photo by Cindy Mclellan. 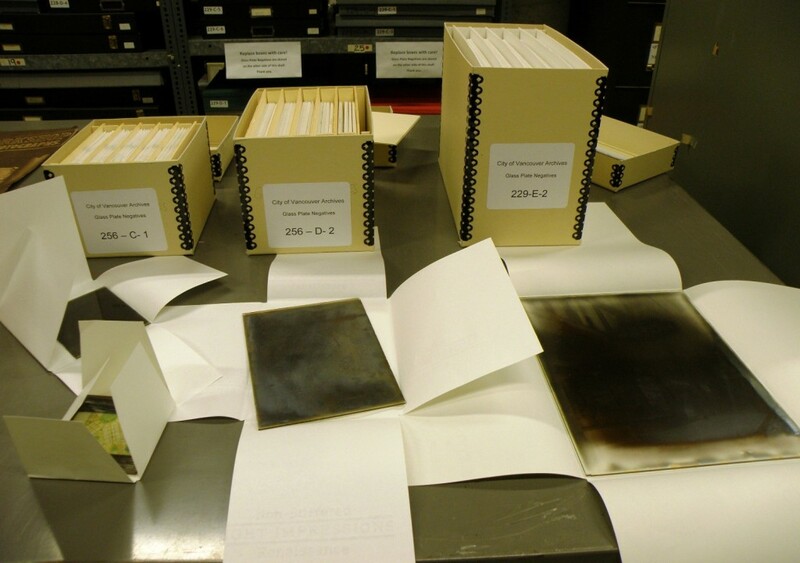 Along with Kristine and some other wonderful volunteers, Kaitlin spent many hours rehousing our glass plate negatives. This was a big job, the second step of an even bigger job. Glass plate negatives come in all shapes and sizes; everything from cute little 5 x 5 cm ones to 21 x 27 cm and many sizes in between. 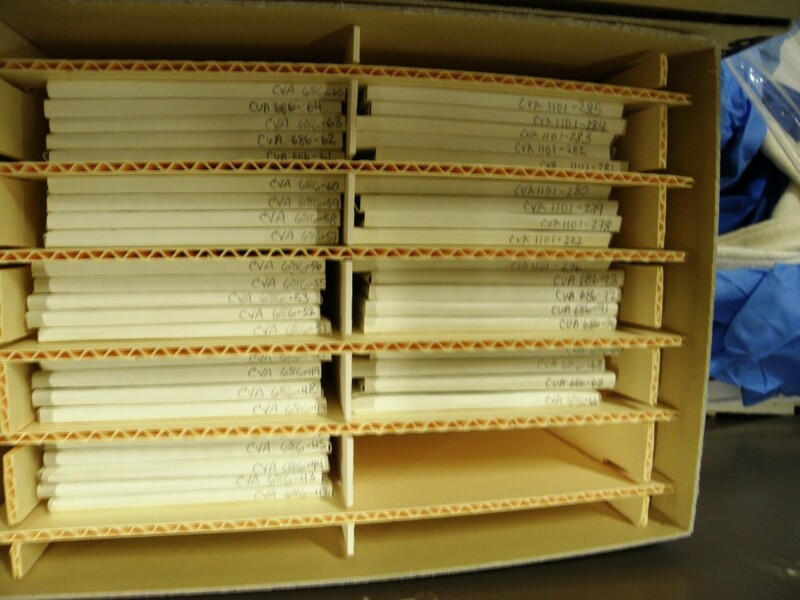 The Archives even has some gigantic glass panorama negatives that require custom boxes. Three standard box sizes and some examples of glass negatives with their four-flap enclosures open. In Major Matthews’ time, these negatives had been housed as a jumble of different sizes of glass plates which leaned dangerously against each other and were housed in acidic envelopes. 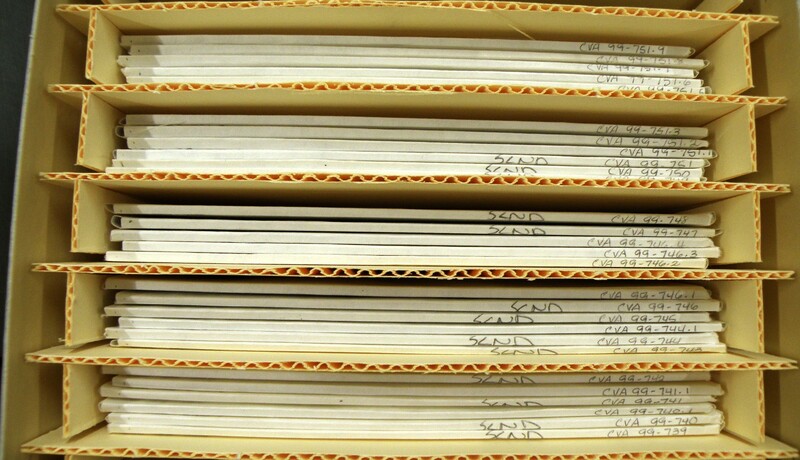 Many years ago, we rehoused them in special 4-flap envelopes for glass negatives and supported them upright, on edge, with negatives of similar size in cushioned file cabinet drawers. The 4-flap design allows the item to be laid flat while the envelope is opened, rather than being tipped or pulled out of an envelope. While this was an improvement, the negatives were still at risk should there be damage to a single cabinet (for example, in an earthquake) and the cabinets were so heavy it was impossible to move them, should the need arise. In this second step, more than 8000 negatives have been rehoused in special boxes that stand the plates on edge and allow a cushion of air around each group of plates. In addition to rehousing, this project required careful updating of a tracking spreadsheet. 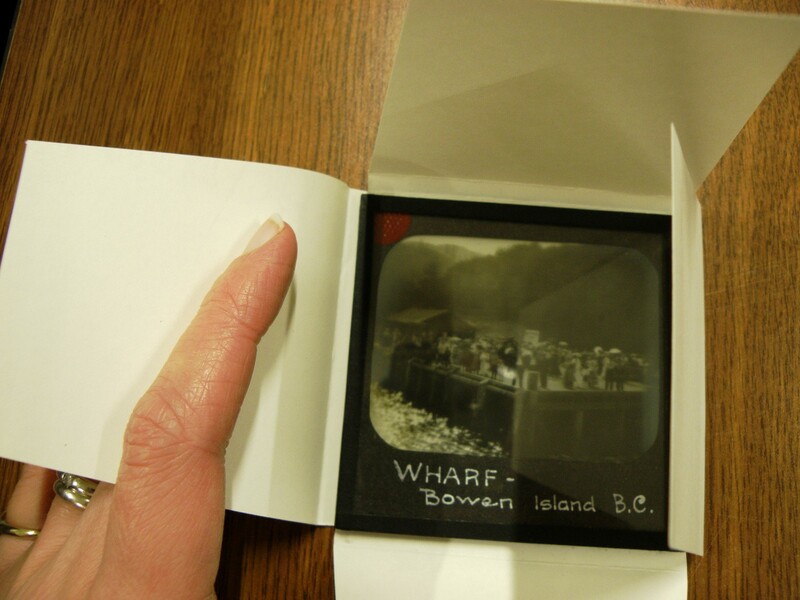 The inside of a glass negative box for standard-sized negatives. Photograph by Cindy Mclellan. Depending on the thickness and style of the plate, between 20 and 25 fit in each box making the boxes easy to lift and safely move. Soon we hope to extend the shelving to create more storage space and use all that air space that was wasted above the filing cabinets. 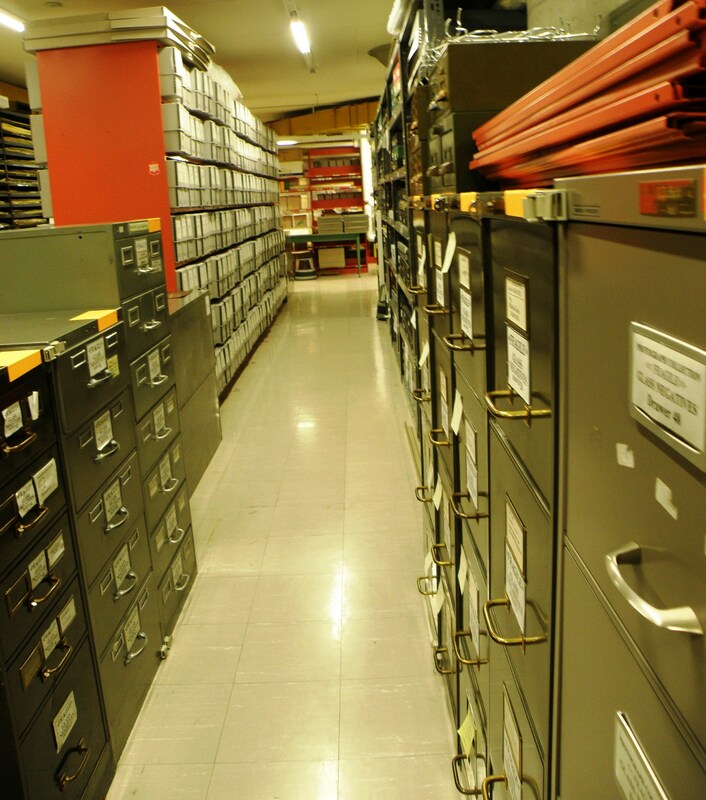 The Archives purchased three standard sizes of box which worked for most, but we had to alter a few boxes to accommodate some of the sizes. This was done by adding foam to the bottom of the box or making extra dividers to prevent the plates from being loose. While supporting the plates snugly, the boxes must allow enough room that they can be easily removed without getting damaged. Cute little glass plate negative that is too small to properly store in the standard boxes. Photograph by Cindy Mclellan. Glass negatives stored neatly in their special modified box. Photo by Cindy McLellan. Digitization is the best way to give access to these breakable materials. Thanks to the spreadsheet created by the volunteers, we have a list of those glass negatives that have not yet been digitized. Boxes of glass plate negatives stored neatly on shelves. We gave Kaitlin a break from working with the glass plates to work on another project. This was also with special formats: maps, architectural plans and technical drawings all produced by the Vancouver Organizing Committee for the 2010 Olympic and Paralympic Winter Game (VANOC). As the buildings that these records show are still standing and in use, access to these plans will be restricted for quite a few years. The work Kaitlin did to record, dates, titles, measurements, exact locations and other basic metadata will help the Archives make these materials available with ease in the future. Thank you Kaitlin for your dedication to the Archives! We wish you all the best in your travels and studies at Dalhousie. This entry was posted in General, Holdings, People, Preservation and tagged glass plate negatives, Volunteers. Bookmark the permalink.